Having roamed around Vancouver, British Columbia, for a few days, I was lulled into the belief that I had found the most livable city on earth. That unobtainable fantasy imploded when I approached the city’s Chinatown and was abruptly startled by the jarring number of homeless people and strung-out drug addicts. But then, as I made my way deeper into the third-largest Chinatown in North America and passed the Sam Kee Building (1926), the world’s shallowest commercial building, at less than six feet deep, I arrived at the colorful entrance gate, embellished with dragons and Chinese characters, of the Dr. Sun Yat-Sen Classical Chinese Garden. Almost instantaneously, the cares and sadness of the harsh world around me dissipated at this oasis of calm and serenity. A subtle and irresistible force pulled me inside, like a lemming over a cliff, but with much nicer consequences. 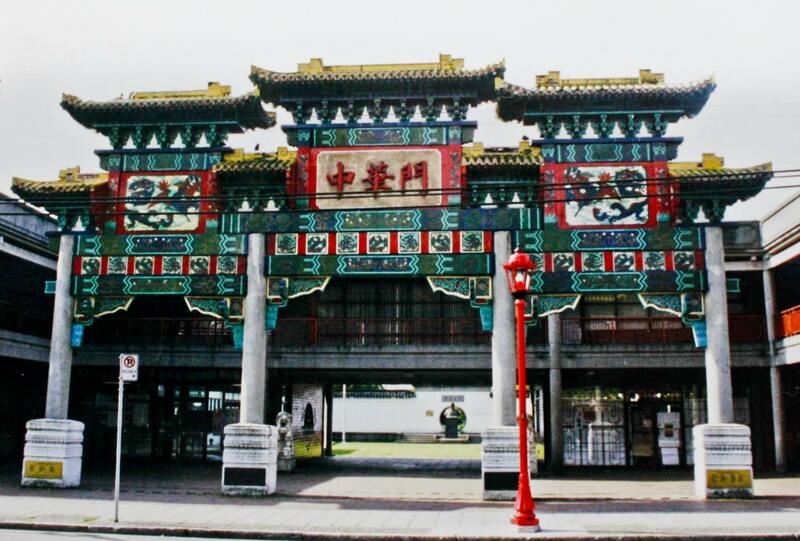 The entrance gate to the Dr. Sun Yat-Sen Classical Chinese Garden welcomes you to a bit of China in Canada. I happened to arrive in time for a guided tour, something I usually avoid in order to discover and learn at my own pace. But my inner voice was quite powerful in its insistence that I join the group, so I surrendered myself for the second time in a matter of minutes. What sort of magical place was this that was completely stripping me of my free will? The guide, a senior citizen volunteer originally from Singapore named Julian Law, set the stage by informing our little octet that everything in this small garden — plants, rocks, trees, building materials — came from China. 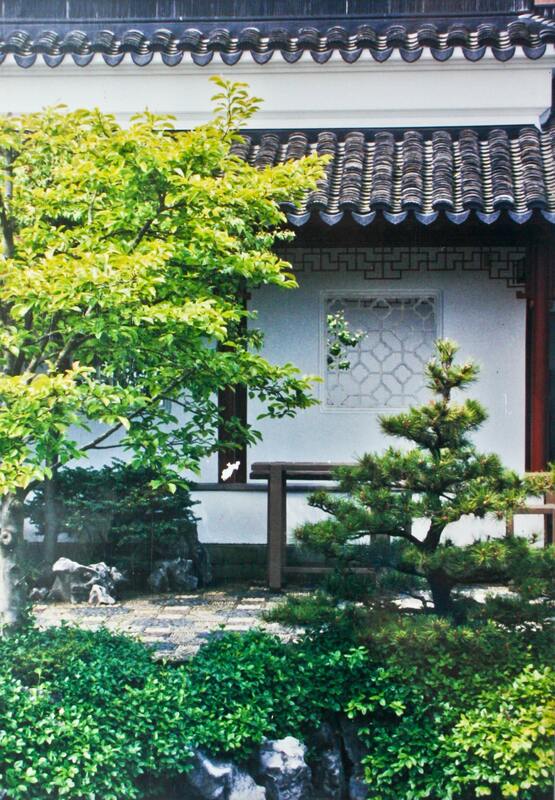 Completed in 1986 after only one year of construction by a team of 52 experts from the city of Suzhou, the garden — on a tiny plot of only about half an acre — was the first full-scale classical scholars garden ever built outside of China. Guided by the principles and techniques of a garden from the Ming Dynasty, which ended nearly four centuries ago, every building and every path was constructed without the use of nails, screws, or glue. Rocks, plants, water, and architecture live in perfect harmony. 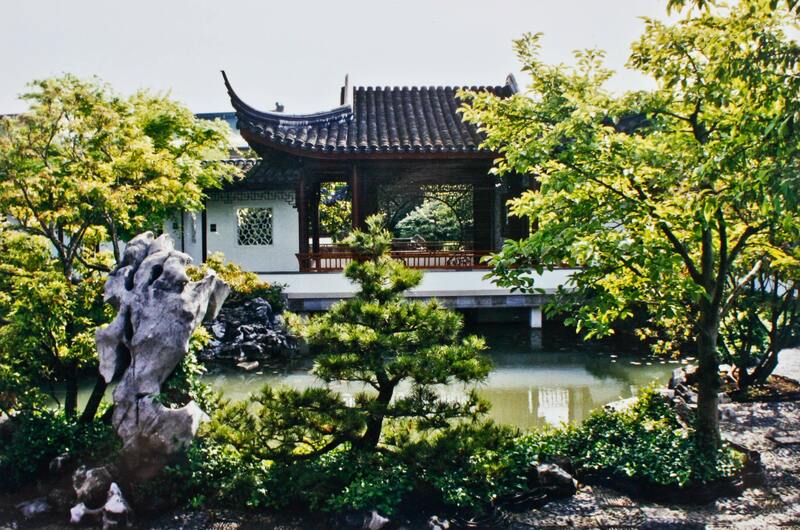 Like every classical Chinese garden, the design of this garden is based on the harmony of four main elements: rocks, water, plants, and architecture. Every single item is here for a reason, symbolic of something and deliberately positioned in accordance with the yin and yang ideal that opposites — bright and dark, manufactured and natural, soft and hard — must be balanced to create perfect harmony. This unity made itself abundantly clear immediately upon entering the garden, because nothing grabbed my attention first. Indeed, everything was in harmony. The water features did not detract from the plants; the buildings did not jump out from their surroundings, but rather blended in with the elements around them. The effects of this flawless equilibrium were swift, as I could actually feel any leftover stress I had been carrying with me simply evaporate. For the next 90 minutes, Julian led us on a trip to a long-vanished time and place, providing explanations of every facet of the garden in a captivating blend of history, culture, and philosophy. His almost shy demeanor belied his skills as a gregarious raconteur. He utterly charmed me with his soft-spoken assurance of what he was describing, peppering his commentary with a funny joke or two, or a very wise observation accompanied by the knowing gaze of a mystic sage. Rain is guided into little valleys in the roof and falls as droplets from the tapered edges. The limestone rocks throughout the garden, he explained, are considered to have supernatural powers that would seduce lucky spirits into the garden. Although solid, the rocks take on a fluid quality during the course of a day, when shifting light elicits different colors in the stone and exposes and then hides crevices and holes. The roughness of these rocks is balanced by the smooth stones of the walkways, which, themselves, achieve a perfect balance of dark, almost onyx-colored stones and light gray ones. The dead rocks (geologists would insist they are anything but) are balanced by the life in the ponds. Lily pads and water lilies float on the surface, occasionally nudged by a passing speckled or orange koi. The jade-green color of the water intrigued me, and I asked Julian why it was so murky. Wouldn’t clarity be prettier and, perhaps, more in line with the tenets of this place? He smiled, perhaps appreciating my question, perhaps trying to stifle a guffaw over my naïveté, perhaps pleased that he could share the reason. The color, he said, was intentionally achieved (by lining the bottom of the pond with clay) so that the garden’s other elements could be better reflected in the water. A large contributor to the character of the garden is the plants. I was there in the spring, but I could imagine the flora’s beauty in any season — at the height of summer, during a vibrant autumn, or through a cold winter, when the remaining greenery and dark branches would stand out, in perfectly balanced contrast, against a gray sky or pure-white snow. The plants here are purposely chosen for their symbolic properties. Julian pointed out the bamboo and winter-flowering plum, plants that persevere under harsh conditions, symbolizing strength in the human condition and resiliency in the face of adversity. And the pine tree, widely regarded as a greeting plant, is specifically located right next to the garden’s entrance. Everything here, from sloping roofs to pathways of alternating colors, has symbolic significance. We continued our tour along walkways that curve and twist, specifically laid out in this meandering manner because evil spirits can walk only on straight paths and, thus, cannot approach or follow you here. They also can’t accost you if you should be reading or participating in an afternoon tea ceremony in one of the garden’s pavilions or halls under the sloping roofs that hook back up at the edge, like a challenging ski jump that would terrify even the most extreme athlete. Should the evil spirits try to descend upon you, they would slide down the precipitous sides of the roof and be shot right back up to where they came from. It’s so rare that a single place can appeal to the interests of such a wide variety of people — architects, botanists, historians, philosophers, landscapers, cultural anthropologists, and garden-variety visitors such as myself — and unite them, temporarily, in the very place founded on the ideal of harmonious unity. When the tour ended, I was reluctant to leave this little Utopia. 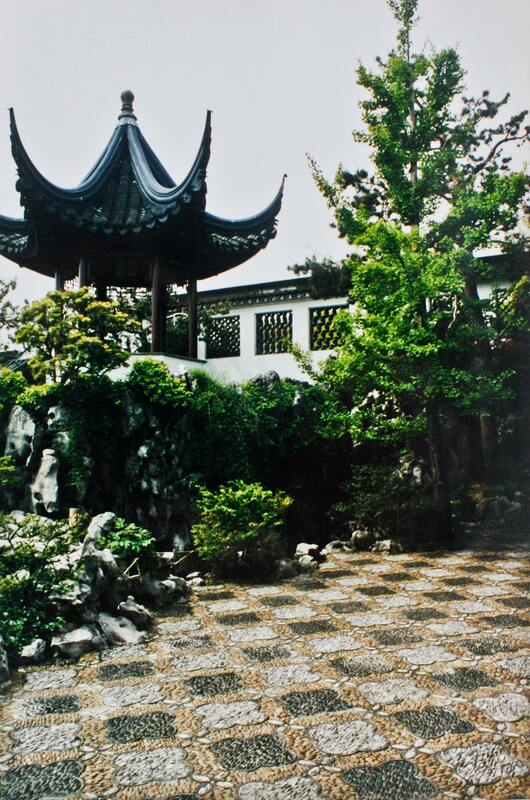 So deep were the effects of Julian’s story-weaving and the enchanting allure of the garden that I hardly noticed the real world around me — now so much more disharmonious than just a couple of hours ago — until I had left the Dr. Sun Yat-Sen Classical Chinese Garden far behind. Nice post. The garden was on my bucket list of places to see during my last visit to Vancouver, but I never got to it. Next time, for sure. And I agree with your observation that the unfortunate circumstances of the down-and-out folks near the Chinatown area belie the image that the tourism office of Vancouver tries to promote. Hope you get to see it next time. Yes, the situation around it is unfortunate. But it’s still a great city. I was there some years ago and thought it beautiful. But I didn’t go on a tour, so missed out on all the info – very interesting, thanks! Glad you enjoyed it. The tour definitely made the difference!